If you are a TLS Hillsborough parent, you may already know Monica as a wonderful warm and engaged teacher (indeed, she was a teacher to my infant daughter, so I am completely biased to her wonderfulness). Our Hillsborough staff know her as a mentor, a motivated team member and a loyal friend. Now our Duke families are coming to know her as their new Program Director/Wonder Woman. 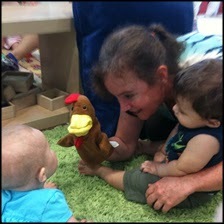 She is a Mother, a Morehead scholar, a world traveler and a passionate voice for high quality early childhood education. What many may not know about Monica is that she has been cheering us on from behind the scenes for many years. Monica first became acquainted with TLS when she was the Manager of Staff and Family programs at Duke, which included oversight of all of the childcare benefits and services for 34,000 employees. Believing strongly in the vision and talent at TLS, Monica advocated to allow local providers to bid on the the project that ultimately become The Little School at Duke. She is a big brainy genius, and also really fun to share a cup of tea with. When she heard of the tumult in leadership this past December, she took her friend hat off and asked “How can I be of service”. Having such love for The Little School, Duke and this project, she had a strong pull to do whatever she could to make it a success. It was so natural, so effortless, so easy-peasy that it felt truly meant to be. Initially she was here in a interim role, but once her feet were on the ground she knew that there was only one choice to make: as she announced in our last parent/staff meeting, she in in it for the long haul and plans on being with us for years to come. Her focus is to be here for the teachers inside and out, to create a professional and positive work environment that makes them excited and proud of their visionary field. We count ourselves extremely fortunate to have her. I could go on and on about my pal Monica, but I will allow her to introduce herself. I got to know The Little School back in 2005, when I was the Manager of Staff and Family Programs at Duke. I visited the various high quality child care centers who were members of the Duke Child Care Partnership and The Little School in Hillsborough (back when it truly was a little school) was one of those schools. The quality of the curriculum and the school’s commitment to including children with special needs in their program made an impression. I became a fan and have been one ever since. The commitment to the Reggio Emilia philosophy permeates everything we do and continues to help me grow personally and professionally on a daily basis. Its fundamental belief that we are all of equal value – children, teachers, management – is one which I hold. It also means that my style of management needs to be one which seeks inclusion and consensus rather than relying on hierarchy and position power. I have taken LOTS of trips in my life so this is a tough one. I have travelled around the world four times, and have spent a substantial amount of time in over 60 countries. I think the most interesting spectacle I ever witnessed was in India. I met the man I ended up marrying on the Delhi-Varanasi overnight express. We arrived in Varanasi at 4:00 a.m. and went down to the river to take a sunrise boat trip down the Ganges. When we were on the river we saw literally millions of people flooding into the town; all congregating on the ghats and bathing in the sacred river. People were chanting, sadhus were standing in gravity-defying yogic positions, funeral pyres were all aglow as this was seen as such an auspicious time to leave this lifetime for the next. We then asked the old man who was rowing our boat past flower garlands, bloated dead cows and floating lit candles what was happening. He informed us that Kumbh Mela was starting on that day. This only occurs once every twelve years in Varanasi and we had never even heard of it and weren’t expecting anything out of the usual Indian assault on the senses. I had never, and have never since, had such a powerful experience of life – millions of people acting in concert because of their shared belief in things beyond this realm – truly awe-inspiring. Steven Hawking or someone of that ilk. I am fascinated by the quantum field and concepts like the time space continuum but my brain isn’t able to conceive of things spatially in a way that allows me to fully understand some of the most cutting edge concepts. I understand the philosophical implications of their theories, but am missing a big piece in the middle – I would need a different brain to be able to fill in the blanks. * If you could offer a newborn child only one piece of advice, what would it be? Not to take it all too seriously, the lighter we can be about life the more we can take on because it doesn’t seem so burdensome. I think The Little School’s motto, “Nothing Without Joy” is speaking to this. * What was your strangest job? I was a nanny to mobsters in Athens, Greece on my first solo trip around the world. I was placed in the job by a reputable agency, once I discovered the underbelly of the family, I booked my ticket to continue on – but it was a truly fascinating interlude. A genius, any day of the week. My mental life is so much a part of who I am I can’t imagine living without the ability to perceive millions of realities and continue to be curious about life. My happiest childhood memory also happens to be my earliest – probably no coincidence. I was out on our patio with my whole family and some of my parents’ friends who had a newborn baby. I was only two and a half years old and they let me hold the baby. I was so awe-inspired and felt so important and valuable to be holding this tiny new life. I dreamt about it for years and as an adult recounted the dream/memory to my parents who were stunned that I remembered it. They confirmed that it really was a memory from my second year of life. Imagine by John Lennon, but I’m sure it would start to ring hollow after about the hundred thousandth time….. There is a quote from a German ecologist, Rudolph Bahro, that I just love. “When the forms of an old culture are dying, the new culture is created by those people who are not afraid to be insecure.” I think it speaks to the times we are living in and my personal belief that we are in a time of great transition to a more sustainable, connected, and humane way of inhabiting this planet. I am still cultivating my fearlessness in the face of uncertainty, and hope to be able to keep stepping out and moving forward in co-creating realities worth inhabiting. The Little School is certainly a reality worth inhabiting and I am thrilled to be here.